Hi, I'm Lydia. Welcome to my avatar and graphics site. I love to create and paint Avatars. I also design customized graphics. Perhaps you have seen some of my work in VP or at Doc Freebird's Southern Paradise. All graphics and avatars are made using either Paint Shop Pro 5.0 or Print Artist with Ulead Photo 2.0. I also make custom static banners. I will attempt or make any graphic you need to your specs for free (or a link back to this page if you have a website of your own). 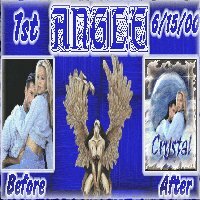 I can also make avatars from your personal pic's. I only do this part time so I will get to your graphic as soon as I can. Just e-mail me and let me know what you need. Feel free to browse and take the Avatars inside for your own use in VP. If you would like to use one of the avatars here as a web page background please feel free to to so, but give credit where credit is due and place a link to my site on the page where the avatar is located. Please sign the guestbook and let me know what you think of this site. Have fun and see you in VP. 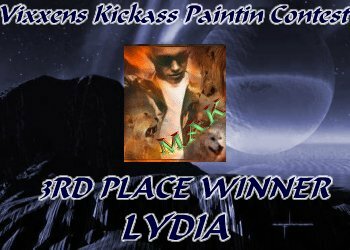 I would like to take the time to thank Sweet Angel for the first award given to Lydia's Avatar's and Graphics.